Eurotranslator dictionaries are compatible with Windows Vista. Eurotranslator Dictionary is a comprehensive 13-language dictionary designed to meet the needs of a demanding individual user. Eurotranslator Business+ is designed for business use. 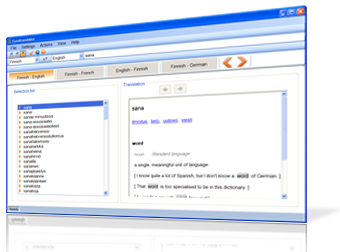 It includes the Eurotranslator Dictionary and access to the Eurotranslator.net Online web-dictionary with a 1-year licence. Eurotranslator Business+ is also available as a network version that eases the use and management of Eurotranslator on company networks. Eurotranslator Business+ price drops if there are more users. Corpus provides examples that illustrate the use of foreign words in complete sentences. The example sentences are in English, Finnish, French, German and Swedish. Pentium, 129 MB RAM, 350 MB free hard disk space and an information superhighway connection for downloading the program or a usb-port for installing from memory stick. Eurotranslator clients are entitled to free e-mail support.